Our Bi-Folding and sliding patio doors bring your garden into your house, thus creating a whole new feel. 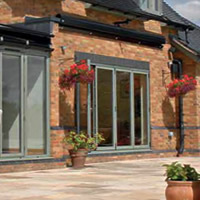 More and more people are choosing bifolding doors over the traditional hinged doors. Our doors are available in a variety of colours in uPVC , timber and aluminium frames. Our Bi-Folding door installation process is efficient and highly professional, taking no more than 6 weeks. Our aluminium bi fold doors fully comply and surpass all UK building regulations and all of our bi folding doors are built with the customers precise and exact measurements in mind. The installation process is carried out by our fully trained and highly professional in-house installation team. We offer a vast range of glass options with our aluminium bi fold doors including all types of standard double glazing, to four seasons’ glass, solar glass and even frosted glass. Along with the sheer beauty and highly aesthetic design of our bi folding doors they will also provide you with huge savings on your thermal energy costs. So what are you waiting for? Get your quote today!